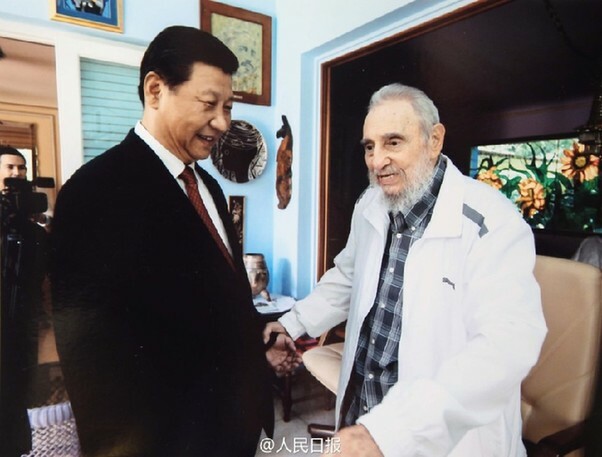 Chinese President Xi Jinping visited Cuban revolutionary leader Fidel Castro Tuesday and the two exchanged views on bilateral ties, the international situation and other issues of common concern. Chinese President Xi Jinping meets with Cuban revolutionary leader Fidel Castro Tuesday. Xi said that his state visit to Cuba is aimed at inheriting and carrying forward the traditional friendship between the two countries jointly built by Castro and the older generations of Chinese leaders, so as to inject new impetus into bilateral cooperation. He recalled the meeting with Castro in 2011 when he visited Cuba, saying he is very pleased to see the Cuban leader in good health now. "You are the founder of the causes of Cuban revolution and construction and also of the China-Cuba relationship," Xi said. "You are deeply admired by the Cuban people and have also won the respect of the Chinese people. We will never forget the significant contributions you have made to the bilateral relationship," he said. Xi briefed Castro on his Latin America tour, including the sixth BRICS summit and his meeting with Latin American and Caribbean leaders in Brazil. Castro, for his part, said he cherishes the memory of his friendly exchanges with China and believes the bilateral relations will yield more fruitful results under the guidance of President Xi and the Cuban leaders. The international landscape is changing profoundly, and the rise of emerging markets and developing countries will have a significant and far-reaching impact on the world, said Castro. The development of China, a great nation, is set to play a significant role in promoting world peace and development, he said. "I have paid very close attention to President Xi' s Latin America trip, and I am delighted to see the successful convening of the BRICS summit and the meeting between leaders of China and Latin American and Caribbean nations," said Castro. Those meetings have produced important and positive outcomes, which will greatly strengthen solidarity and cooperation among developing countries and push for reforms in the international governance system, he added. Castro believed cooperation among BRICS countries would be constantly deepened and hoped Latin America and China score greater achievements in their collaboration. During their talks, Castro also showed Xi around in his courtyard and farm, where the seeds of Moringa oleifera and mulberry, gifts from China years ago, have grown into trees with luxuriant foliage. The growth of such plants is being promoted in Cuba, which helps provide more grain and livestock feed, said Castro. Xi said he is bringing more such seeds to Cuba this time and hopes they will grow and thrive, and become a new symbol of the China-Cuba friendship. He said China is willing to enhance agricultural cooperation with Cuba to jointly improve this sector and safeguard grain security. Xi also extended good wishes to Castro for his upcoming 88th birthday, while Castro sent his regards to the Chinese people. The Chinese president arrived here Monday for his first state visit to Cuba since taking office. It is also the last leg of his four-nation Latin America tour, which has already taken him to Brazil, Argentina and Venezuela.